Okay people, It is at the height of local strawberry season. This dessert is so lick-your-fingers yummy that I don’t want you to miss it and have to wait until next May/June to enjoy this strawberry classic. The local produce store on Main Street here in Hellertown has local berries as does Bechdolt’s Orchard. Or try a farmer’s market for fresh flavorful local berries. 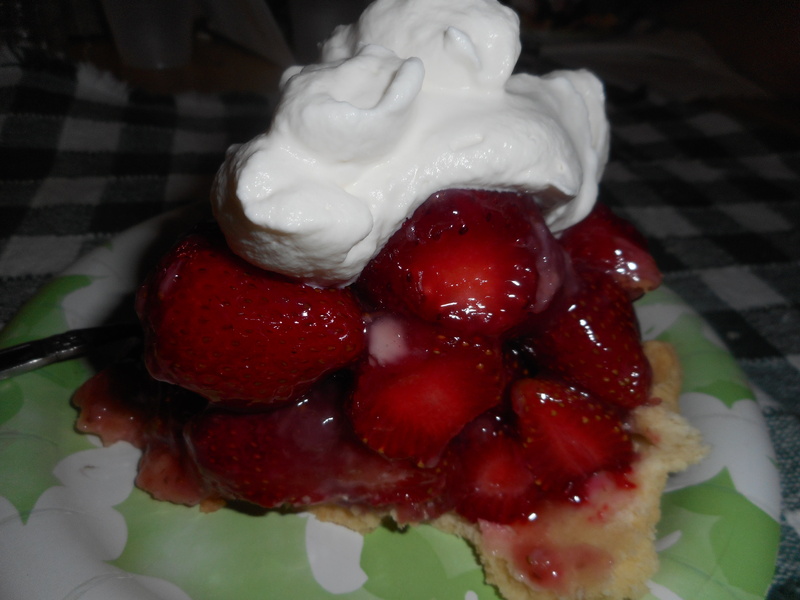 If you can make a crust and stir the strawberry goop you can make this. If you are one of my wheat loving friends; make what ever basic crust you like. The filling is naturally gluten free. My mom loves this pie and frankly so does our entire family. Mom never put the cream cheese on the bottom but I like it as it keeps the crust from getting soggy and adds a delicate counter point to the sweetness of the filling. It is not a great summer if you don’t indulge in this dessert at least once! Mix dry ingredients in bowl of stand electric mixer. Add butter and mix until crumbly and resembling coarse meal. Add egg and juice. Mix until it comes together into big chunks. Shape into a ball with your hands. Put it on a crust sized piece of wax paper (14 x 14 inches more or less), flatten the crust ball some; put on top of it another piece of wax paper and chill it all in your fridge 15-20 minutes. Roll out pie crust in a pie bag or between the two sheets of wax paper, try to get the thickness even, no thick middle! Peel off one side of paper and place in pie pan, centered. Remove other slice of wax paper. Crimp edges all around. Prick it in a dozen places with a fork to keep it from blowing up bubbles. Bake in a preheated 375 degree oven for 12-15 minutes until the crust is light brown. Cool at least 30 minutes before filling. 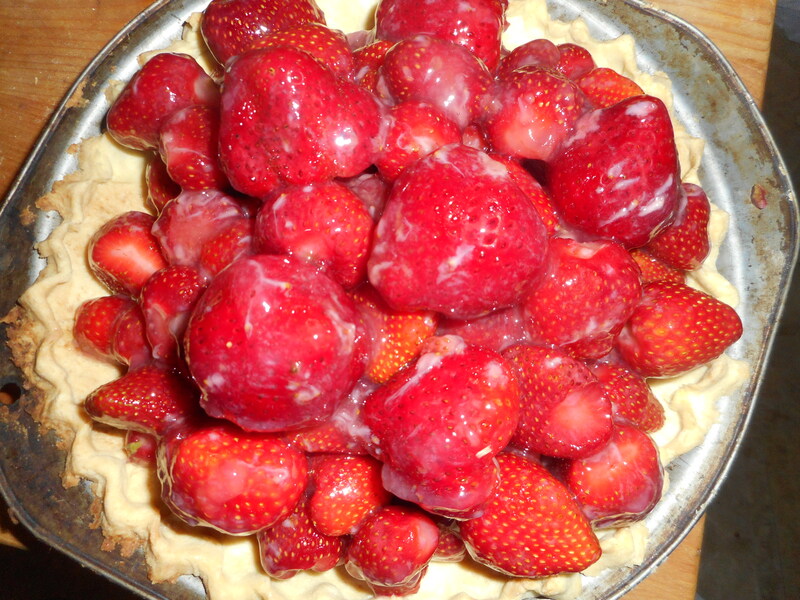 Mix sugar and cornstarch in 1 qt heavy bottomed sauce pan, stir in water and mashed strawberries. Cook on medium heat until it boils, stirring constantly. If it seems too thick, add up to half a cup more water. It needs to be thin enough to cling to your berries. Boil and stir one minute. Let cool at least 20-30 minutes or until close to room temperature. Line the bottom of the cooled pie shell with the cream cheese, spread it as evenly as possible. I use ½ an 8 ounce package. Place berries in a big bowl. Pour the glaze over top and gently mix. Pour the goopy berries into the pie shell. I like to pick the nicest ones for the top of it. Chill 2-3 hours before serving. Make some real whipped cream, the fake stuff will not do for this pie; 1 cup heavy cream whipped with an electric mixer or a whisk until soft peaks, I like to chill the bowl and beaters a few minutes as it helps the cream whip faster. Then add 2-3 tbsp powdered sugar and ½ to 1 tsp. vanilla. Beat just a bit longer, until nearly stiff peaks. Slice the pie and top each piece with the whipped cream. Dive in! You won’t be disappointed.